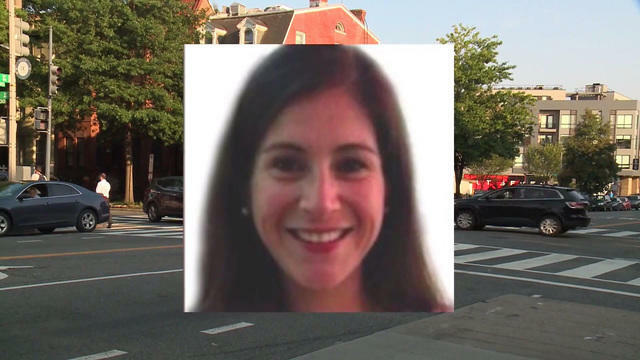 Surveillance video shows moments after jogger is fatally stabbed in Washington, D.C.
Video: Jogger stabbed to death in D.C.
WASHINGTON -- Police say an avid runner who was killed in a residential neighborhood in the nation's capital was likely a random target. D.C. Police Chief Peter Newsham said the stabbing of 35-year-old Wendy Karina Martinez was likely random and they announced Thursday that a suspect had been arrested. Police say the Georgetown alumna was stabbed multiple times Tuesday night and managed to stumble into a nearby restaurant for help. The restaurant's manager, Tommy Wu, showed CBS News correspondent Chip Reid surveillance video of the incident, which appears to show an injured Martinez collapsing as patrons rush to her aid. Newsham said a nurse in close proximity attempted life-saving efforts before emergency crews arrived, reported CBS affiliate WUSA-TV. Martinez was taken to a hospital where she died of her injuries. "We are deeply saddened by this senseless tragedy. Wendy Karina Martinez was the light of our lives. Not only was she an avid runner, but she was a devout Christian, a wonderful friend, and a driven professional. Everything you hope that a daughter and a friend could be. She was also excited to be planning her upcoming wedding to her fiancé, Daniel Hincapie. They were engaged just last week." Martinez was an avid runner known to run several miles across the city. She lived close to where the stabbing happened, Newsham said. Police are offering a $25,000 reward for information leading to the conviction of a suspect.